Two late goals from Brown Ferguson secured a 2-1 win for Alloa against Raith Rovers and lined up a home tie against Aberdeen in the Scottish Cup. Having squandered first half chances, Raith took the lead in 57 minutes through Gary Wales from 12 yards. Alloa's equaliser was scored from close range by former Partick Thistle midfielder Ferguson in 79 minutes. And Ferguson put the Wasps into the fourth round two minutes later with a deflected free-kick past Gary O'Connor. Alloa: Jellema, McClune, Campbell, Buist , Forrest (Wilson 63), Hill, Jamie Stevenson (McKeown 85), Brown Ferguson, Scott (Andrew Ferguson 63), Grant, MacAulay. Subs Not Used: Spence, White. Goals: Brown Ferguson 79, 81. 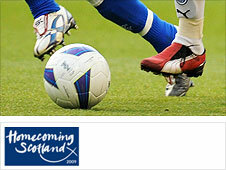 Raith: O'Connor, Wilson, Ellis, Campbell, Davidson, Walker, Sloan, Wardlaw, Wales, Weir (Silvestro 63), Ferry. Subs Not Used: Cook, Mackie, Wedderburn, McGurn.